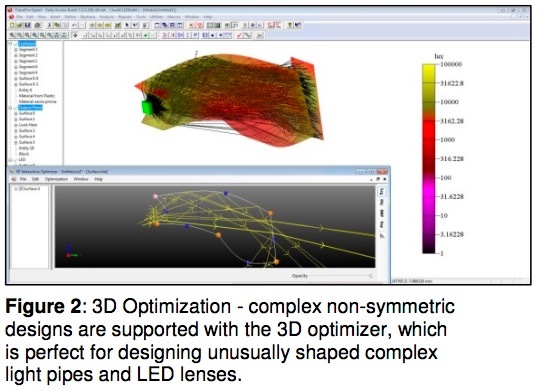 TracePro streamlines the prototype-to-manufacturing process for optical and illumination systems using 2D sxymmetric and 3D non-symmetric optimizers. Different from traditional optimizers, TracePro offers an easy-to-use and unique capability to interactively monitor and control the process every step of the way. 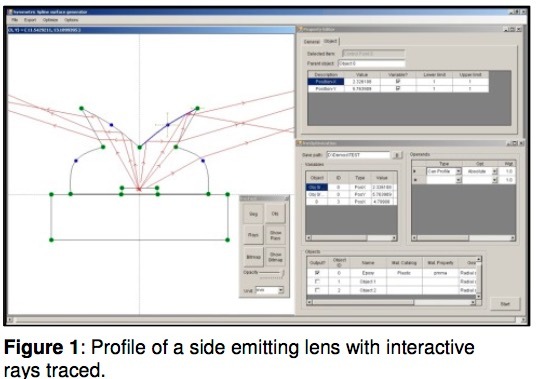 You start the design process by sketching the starting design, digitizing variable limits directly into the CAD sketch utility and establishing a merit function using intensity, efficiency, irradiance, color, and/or uniformity parameters. solid object, and control positioning of solid objects. Each variable can be visually checked before, during, and after optimization. that converges to the local minimum solution closest to the starting point. During an optimization, you have complete control of the process and can monitor the interim solutions. You can stop the optimizer and change the initial starting parameters, then re-start the optimization. This allows you to control the process and test for better solutions in less time. and user-defined Path (2D, 3D). Varies depending on the selection, generally includes origin, tilt center and angle (X, Y, Z), tilt then shift, thickness, material type, surface properties, draft angle, and refractive index. 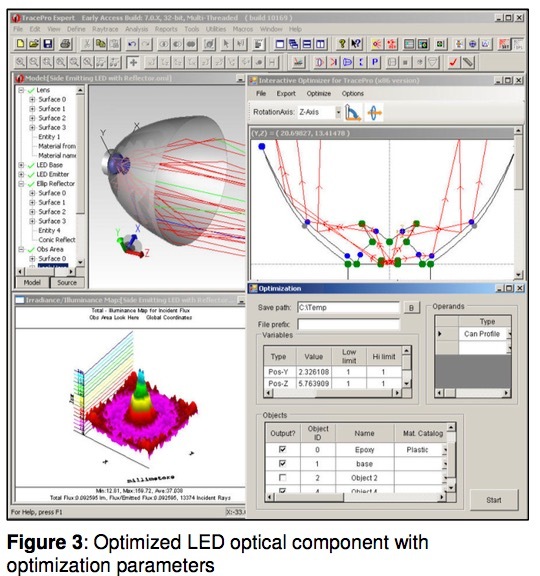 Utilizes operands to specify multiple values on which to optimize, including: flux, color space (CIE), irradiance distribution, irradiance profile, intensity, candela profile, and uniformity. Users can also define their own optimization targets.